Does high CEO pay matter to shareholders? 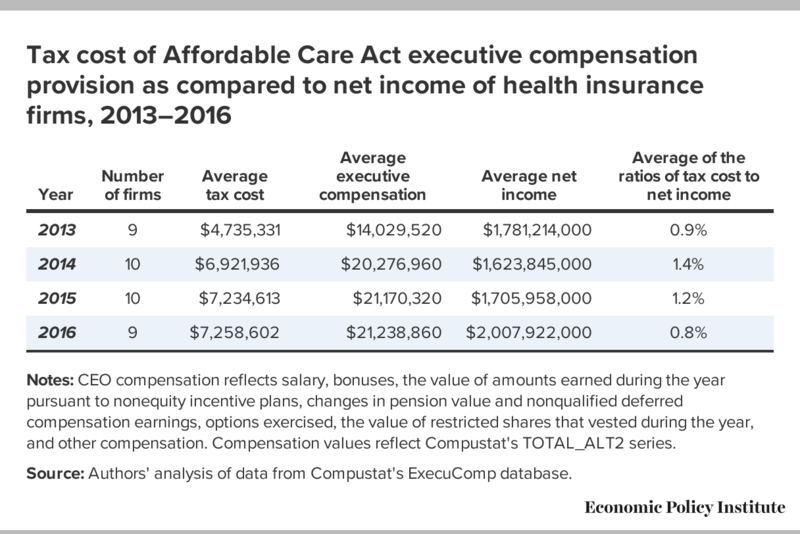 Last month, we did an analysis that examined the impact of a provision of the Affordable Care Act limiting the amount of CEO pay that could be deducted from profits to $500,000. In the years after it took effect, this provision raised the cost of CEO pay to employers (i.e., shareholders) by more than 50 percent. Prior to 2013, shareholders of health insurance companies effectively paid just 65 cents on every dollar of CEO compensation, since their taxes would fall by 35 cents for every dollar they paid out. After 2013, they would be paying 100 cents of every dollar. If CEO pay bears a close relationship to their value to the company, this change in the tax code should have led to some reduction in their pay. Using a wide variety of specifications, controlling for growth in profits, revenue, stock price, and other relevant factors, we found no evidence that the pay of health insurance CEOs fell at all in response to the limit on deductibility. While this finding does support the view that CEO pay is not closely related to their value to shareholders, it is worth asking how much this provision mattered to insurers’ bottom line. In other words, how much more did they effectively end up paying to their CEOs, measured as a share of profits, as a result of the change in the tax code? Notes: CEO compensation reflects salary, bonuses, the value of amounts earned during the year pursuant to nonequity incentive plans, changes in pension value and nonqualified deferred compensation earnings, options exercised, the value of restricted shares that vested during the year, and other compensation. Compensation values reflect Compustat's TOTAL_ALT2 series. Source: Authors' analysis of data from Compustat's ExecuComp database. The average cost for the four years ranges between 0.8 percent of profits in 2016 and 1.4 percent in 2014. Is this the sort of amount that companies would typically worry about? To take a couple of comparisons, Apple’s annual profits have been running in the $40 to $50 billion range. Would Apple be interested in a tax scheme that would add $400 to $500 million to its bottom line each year? Alternatively, General Motors has roughly 50,000 hourly employees. Its after-tax profit in both 2015 and 2016 was around $9.5 billion. (2017 appears to have been a bad year due to tax timing.) Would General Motors be concerned about a $2,000 increase in the annual pay of its workers or as a per worker addition to their health care costs? This would also be roughly 1.0 percent of its profits. To take another example, the Federal Register put the cost of all Dodd-Frank provisions at a cumulative total of $10.4 billion for its first six years, or roughly $1.7 billion annually (note that these are gross costs to the companies in the industry—the act also provides benefits). Since after-tax profits for the financial sector have averaged close to $200 billion annually, this puts the Dodd-Frank costs in the neighborhood of 1.0 percent of profits. The additional cost of CEO pay as a result of the deductibility limit clearly was not going to drive insurers into bankruptcy if they chose to ignore it and leave their CEO pay policies unchanged. Nonetheless, there do seem many instances where companies have been concerned about comparably sized or smaller threats to their profits. Based on these other situations, there should have been enough at stake to get their attention. The failure of CEO pay to respond to the change in deductibility for health insurers hence seems consistent with the view that CEOs and top management are to a large extent writing their own paychecks and that shareholders have little ability to stop them. The people who most immediately determine CEO pay are the boards of directors. The directors often owe their positions to top management. They can also count on staying on the board as long as they don’t rock the boat. More than 99 percent of directors who are nominated for reelection win. While it is possible for an activist investor to organize to remove board members if they feel they are not doing their job in reining in CEO pay, this is an extremely difficult task for a limited potential gain. Think of the people in a neighborhood organizing to remove members of their city council and/or mayor because they are unhappy about potholes on their street. It’s not impossible, but it just doesn’t occur very often. This story would suggest that we need to change the rules of corporate governance to make it easier for shareholders to act against top management. Congress made a very small step in this direction in the Dodd-Frank financial reform bill. This bill contained a provision that requires CEO pay packages be sent out to shareholders for a yes or no vote every three years. This “say on pay” vote is nonbinding. It can be embarrassing to a company’s board to have a package voted down, but it doesn’t directly change anything. The vote could be made to have more consequence. For example, the law can be rewritten so that the board forfeits its pay if the CEO pay package is voted down. This would give boards a large incentive to avoid overpaying their CEO. This sort of change may still not be adequate to get CEO pay back down to earth, but it could be a good first step. Directors need to have some incentive to restrain CEO pay. It does not seem this incentive exists at present.